Mission accomplished: Porsche has achieved its 17th overall Le Mans victory at the 83rd running of the famous 24-Hour race in a perfect way with a one-two finish. Drivers Earl Bamber (NZ), Nico Hülkenberg (GER) and Nick Tandy (GB) won the coveted trophy in their innovative Porsche 919 Hybrid exactly 45 years after Porsche’s first overall win at La Sarthe was achieved. Timo Bernhard (GER), Brendon Hartley (NZ) and Mark Webber in the sister car added the icing on the cake when they came home in second. Romain Dumas (FR), Neel Jani (CH) and Marc Lieb (GER) brought home the third Porsche 919 Hybrid in fifth. No other brand has managed to win the world’s toughest endurance race so many times and is connected that closely to the myth of Le Mans. The previous win was also a one-two – back in 1998 when Allan McNish (GBR), Laurent Aiello (FRA) and Stéphane Ortelli (MC) finished first in their Porsche GT1. The winning number 19 prototype had started third on the grid, and for a short time at the beginning even dropped down the order to eighth before settling in sixth for a longer period. Of all things, it is the rookie crew that won the monstrous classic. Neither Formula One driver Nico Hülkenberg, who had the joy of being in the car at the most emotional moments of the race, being the start and the finish driver, nor Earl Bamber brought Le Mans experience with them. Nick Tandy, the third driver of the winning trio, had at least done two Le Mans 24-Hours for Porsche in the GT class. By doing super fast laps, staying calm but highly focused, the three of them drove a race with no errors and won it by their own merits. In the early stages of the men and machine stressing marathon the number 17 Porsche had been leading. However, a one-minute stop-and-go penalty at the end of the first third of the race dropped them back to fourth. 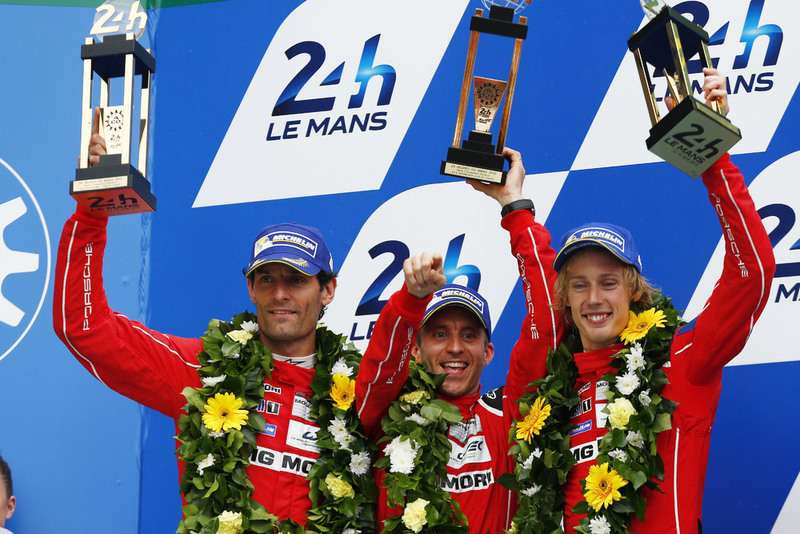 Timo Bernhard, Brendon Hartley and Mark Webber kept their heads down and worked hard. With a consistently strong performance they made it up to second place. The crew of the third Porsche 919 Hybrid had a rather tricky race. Pole-setter Neel Jani lost the lead right after the start to Timo Bernhard. For some time the drivers were unhappy with the braking stability, and two offs from the track didn’t help either. Given that chronology of events, more than fifth place wasn’t within reach this time for the fast trio with the number 18 car. Congrats Mark !! Great job , great drive ! Love your Work Boys…..Been Absolutely glued to the News about this car, Porsche, and Of course Marks progress forever. Awesome stuff Mark, Great to have a local from down the road standing on the podium at LE MANS.. Keep enjoying what you do well. Keep the Aussie flag flying proudly mate. As a Porsche tragic of many years, and a follower of your exploits, congratulations Mark. This is another win, which I have all your F1 podiums on DVD. Well done to the whole team! May be that your old team at Red Bull could use some input and have Porsche power the cars? Congratulations to you Mark and your team for the podium finish. You guys did a great job! Proud of you. Exciting race to watch!